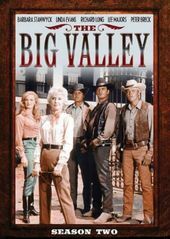 Setting is the 1870s in California's gorgeous San Joaquin Valley, The Big Valley is the story of Stockton's richest and most powerful family, The Barkley's. Lead by the family matriarch and widow Victoria Barkley, they live on the Barkley Ranch managing their cattle herd, mines, citrus groves and logging camps. Victoria's four adult brood consists of her two sons Jarrod and Nick, daughter Audra and step-son Heath. Jarrod, a prominent lawyer, handles all of the families legal issues and manages his two law offices in Stockton and San Francisco. Nick, a strong built rancher, physically manages the family's holdings. Nick is aggressive, out-spoken and at times hot-headed. Victoria's youngest child is her beautiful daughter Audra. Audra is protected by all of the family members. Audra is very sensitive, caring, loves horses, and is a very talented rider. Heath, Victoria's step-son, helps Nick manage the family's processions.